Masonry can involve building anything from these materials from residential and commercial building to paths and walls. Through this course you will learn the characteristics of different materials, how to choose the right material for the purpose, and how to use that material to construct a viable structure that is fit for the intended purpose. Find out how to add value to a property. Learn about the tools and techniques involved in building restoration. Learn to plan, prepare and execute a renovation project to repair or improve part or all of an existing building. Learn about working with wood in landscaping, building construction, furniture making, fencing or any other application. Learn how to make repairs or construct things from wood yourself rather than waiting and paying for a tradesman to do something you could have done faster and cheaper. Improve your employability in the landscape industry with these added skills. This course provides a balanced and broad understanding of woodwork by exploring the broad range of applications and in doing so, complements and enhances the development of your knowledge about carpentry. 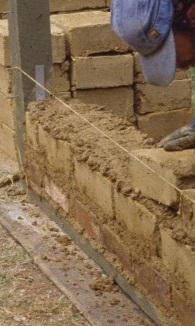 If you've thought of building a mud brick building, this course can be an excellent starting point. Its very practical, with some hands on work to get you started helping you begin experimenting and planning ongoing projects - whether a modest garden wall, or more complex buildings. Learn to make a quality bricks & how to test their strength. The course takes you step by step through the building process, showing how to plan a building, sorting through permits and other legalities, doing the site works and foundations, different construction techniques, laying bricks, frames and roofs, installing services, wall finishes and more. Learn to Maintain Properties - Inside and Out. Learn to build with wood, stone, mud and other environmentally friendly materials to create interiors and exteriors that are more people friendly.